Home→Freebies→Veterans Day Discounts & Freebies 11/11! 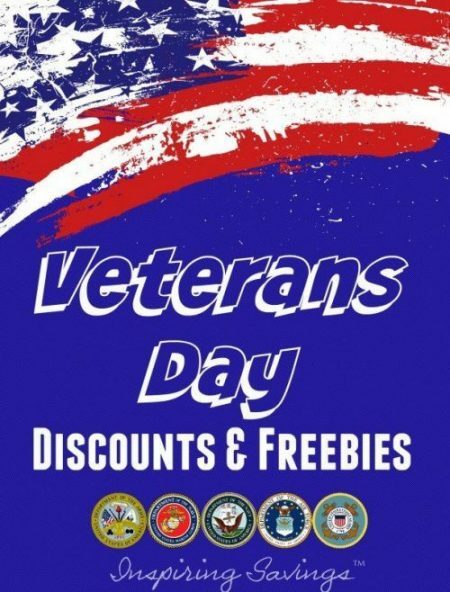 Veterans Day Discounts & Freebies 11/11! A list of National 2018 Veterans Day free services or discounts, such as free or discounted hotels, haircuts, car washes and many more deals specifically for veterans and active duty military. Being raised in a Military family I have seen & felt first hand the hardships that military families endure. It is of GREAT pleasure to say, THANK YOU for your service!! I want to mark this special day by presenting to you a list of Veterans Day Discounts & Freebies you can enjoy. Each year businesses honor Veterans and Servicemembers by offering Veterans Day discounts on goods, services, and dining. Please make sure you bring your Military ID with you. Also, make sure you pay attention to the dates listed below. There are some offers that are occurring after veterans day. Veterans Day 2018 will be on Sunday, November 11th, 2018 and designated as a Federal Holiday on Monday, November 12th, 2018. Wondering about Year Round Military Discounts? You can check out this comprehensive list. Please note that the 2018 freebies & Discounts have not been released. Bowman’s Apple Orchard – 20% Off Discount from November 11 – November 18th with Military ID. Home Depot – Offers a 10 percent discount to all Veterans during Veterans Day, Memorial Day and Independence Day. Home Depot offers the 10 percent discount year round to for active duty and retirees. Foot Locker – Veterans, Service members (Active, Guard, and Reserve), and their immediate families with a Foot Locker Veterans Advantage Card receive a 20 percent discount every day of the year. That offer is good both online and at any store location, including Foot Locker, Lady Foot Locker, Kids Foot Locker, Foot action and Champs Sports — even on sale items. Lowe’s – All Veterans receive the 10-percent discount on Veteran’s Day, Memorial Day and the Fourth of July. The offer is available in stores only and is limited to in-stock and special-order purchases of up to $5,000. Ocean State Job Lot — All Active Duty Military and Retired Personnel, Veterans, National Guard, Reservists, and their families get 25 percent OFF* everything in all stores. Target – Target is offering 10% Military Discount on In-Store & online Purchases through 11/12/18! To get this promotion you will need to complete this form. The coupon will be sent via email. Verizon Wireless – As a valued active service member or veteran, we offer to you a 15% discount off your monthly Verizon Wireless service and 25 percent discount off select accessories. This discount is available everyday and not just on veterans day. Great Clips – Veterans and current active members who are serving can get a FREE Haircut at Great Clips on Veterans Day! 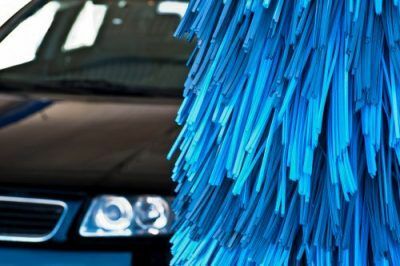 Hoffman’s Car Wash – Free Car Wash for veterans & active military on 11/11. Free Fishing Days – Veteran’s Day has been declared a free fishing day. Anyone can fish the fresh or marine waters of New York State and no license is required. Inns & B&B Free Night Stay – Inns and B&Bs throughout the U.S. and Canada will open their doors to thank veterans for their service. Dates vary by state and Inn. New inns and B&Bs will be added daily. Liberty Ridge Farm – All veterans will get $2 off admission entry ticket to come to explore the farm. Open from 10 am – 3 pm. Enjoy corn mazes and lots of family fun activities. Motels – 10% off hotel booking at select hotels with verified Troop ID. Sports Clips – Veterans and active duty U.S. service members with proof of service can stop in on Saturday, November 11, to get a free haircut at any participating Sports Clips. US National Park Service –– The U.S. National Park Service is waiving fees at most of its day-use recreation sites over the Veterans Day holiday weekend, 11/11. Go online to find a national forest or grassland near you. World of Coca-Cola in Atlanta – complimentary admission to all military members (active duty, reserves and retirees) year-round, but to show gratitude on Veterans Day to the men and women who serve our country, the attraction is extending a special offer to their loved ones as well. From Thursday, Nov. 1 to Sunday, Nov. 11, members of the Armed Forces may purchase up to four half-price general admission tickets for their friends and family to join them in visiting the attraction. Tickets may be purchased with a valid Armed Forces ID card at the attraction’s ticketing windows. *Arby’s – One FREE Roast Beef Classic Sandwich on Veterans Day at participating locations during normal business hours. Bob Evans – Veterans and active military personnel can stop into any Bob Evans location at any time on Saturday, November 11 to receive free breakfast, lunch, or dinner. Choices include Stack of Hotcakes; Fresh Baked Brioche French Toast; Country Biscuit Breakfast; Mini Sampler Breakfast; Farm Boy Sandwich; or Country Fried Steak Dinner. Bruegger’s Bagels – Active military members and veterans can stop into Bruegger’s Bagels for a free small drip coffee on Saturday, November 11, in honor of Veterans Day. Buffalo Wild Wings — On Veterans Day, from 4:00 pm-7:00 pm veterans and active-duty military personnel visiting their local Buffalo Wild Wings restaurant will receive one a small order of traditional or boneless wings and a side of fries for free. *Carrabba’s — Veterans or active military members can stop by a Carrabba’s near you and get a free appetizer of your choice on 11/11. Cici’s Pizza – Anyone with an active or retired military ID can get a free buffet at Cicis on November 11 for Veterans Day. This includes pizza, salad, desserts, and more. Chuck E. Cheese’s – is giving out one free personal 1-topping pizza to all active duty, national guard, and retired military members. Cracker Barrel – Veterans receive a complimentary Double Chocolate Fudge Coca-Cola Cake dessert to veterans and an opportunity for guests to make purchases that support the United Service Organizations (USO) on 11/11. Denny’s– Free Build Your Own Grand Slam on Nov. 12, from 5 a.m. to noon. Dunkin Donuts – Free donuts to active duty military and veterans on Sunday, November 11, 2018. This free Veterans Day donut is limited to one per customer while supplies last, but no purchase is required and you just need to show military ID. Golden Corral — Free Dinner for Veterans & Active Military on 11/12 from 5 PM to 9 PM. IHOP — On 11/12, IHOP Restaurants will be offering free Red, White and Blueberry pancakes. At some locations, the Red, White and Blue pancakes will be featured as part of a free combo plate including eggs, bacon and hashed browns. Krispy Kreme – Veterans and active-duty military can start their Veterans Day off with a free breakfast at Krispy Kreme that includes a doughnut and a small coffee. No purchase, ID, or coupon is necessary. *Little Caesars – Free Lunch combo from 11am – 2pm at Little Caesars Pizza locations for veterans and active military on 11/11. Must present a valid military ID. LongHorn Steak House — LongHorn Steakhouse is giving away free appetizers and desserts to veterans and active service members who stop in to Longhorn Steakhouse on Sunday, November 11, 2018. Plus, eligible customers also get 10% off their table’s total check. *Menchies — Free 6 oz. cups of frozen yogurt to veterans and active duty military all day on 11/11. You’ll need to show military ID or dress in uniform to receive this offer. Ninety Nine Restaurant & Pub — On 11/11 from 11am – 4pm, veterans and active military will receive a free lunch* from the 9 Real Size Entrees for $9.99 menu. This free offer is with the purchase of any entree. Olive Garden — On 11/11 all veterans and military active duty will receive a free meal. 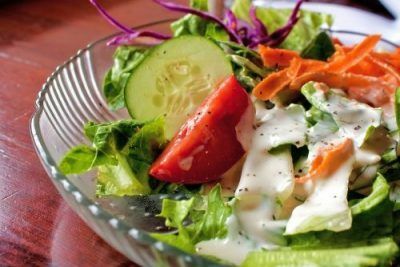 This meal includes freshly baked garlic breadsticks and a choice of unlimited soup or salad. *Panera Bread — One free You Pick 2 for veterans and active duty members on Veterans Day at participating locations. Bring proof of service. Price Chopper — All active duty & veterans get to enjoy a Free 12 oz Coffee and Donut on 11/11 from 7 am – 7 pm. Red Lobster — Service members past and present receive a free appetizer or dessert from a special menu. Proof of service required. Red Robin– A free Tavern Double Burger with bottomless fries to all veterans and active duty military on Veterans Day. Military also receive a 10% discount every day. Ruby Tuesdays – Will receive a FREE appetizer up to $10 value on Veterans Day. *Stewarts Shops – Stewart’s Shops will be offering $0.50 single scoop cones to all customers on Veterans Day. Starbucks –– Will be giving out free tall brewed coffees to veterans, active duty military, and their spouses on Veterans Day. TGI Fridays – TGI Fridays will be having a free meal for all veterans and active-duty military on Sunday, November 11, 2018, as well as the following Monday, November 12. Did I miss any? Please let me know. I would love to share. My dad is going to be eating like a king all weekend long.